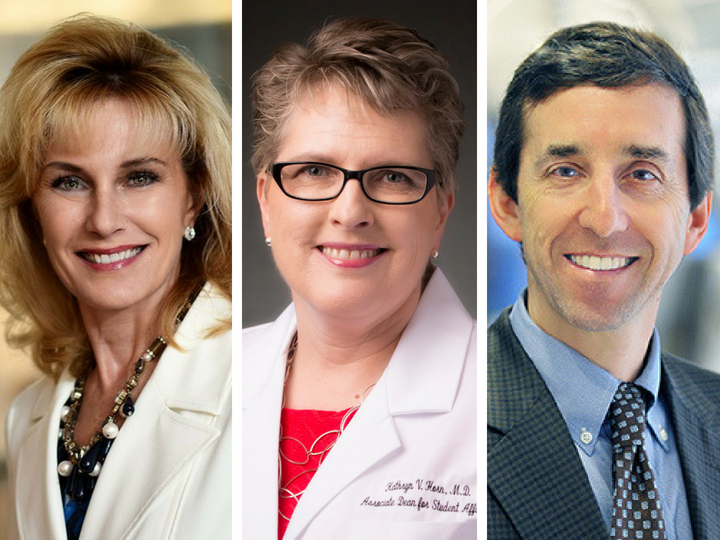 The University of Houston College of Medicine has added three accomplished medical educators to its leadership team. Dr. Ruth Bush joins UH as associate dean for medical education; Dr. Kathryn Horn has been hired as associate dean for student affairs, admissions and outreach; and Dr. David Buck is the associate dean for community health. Dr. Stephen Spann, vice president for medical affairs and founding dean, said each brings a wealth of knowledge in developing medical students and working with patients and communities. The UH College of Medicine was approved by the UH System Board of Regents in November. It will focus on training primary care physicians to address a shortage in Houston and across Texas, while improving access to health care in underserved urban and rural communities. Dr. Ruth Bush, associate dean for medical education: Dr. Bush most recently served as a tenured professor at Baylor College of Medicine in the Departments of Medicine and Surgery and deputy director of the Center for Innovations in Quality, Effectiveness and Safety at the Michael E. DeBakey Veterans Affairs Medical Center. In these leadership roles, she oversaw scientific program operations and research of 200 faculty and staff. A graduate of the University of North Carolina School of Medicine, Dr. Bush previously held faculty positions at the Texas A&M College of Medicine and was the chief vascular surgeon at the Olin E. Teague VA Medical Center in Temple, Texas. In addition to being an accomplished physician and medical educator, Dr. Bush is also an attorney. Dr. Kathryn Horn, associate dean for student affairs, admissions and outreach: Dr. Horn spent nearly three decades in various leadership and faculty roles at Texas Tech University Health Sciences Center El Paso. She served as the assistant vice president for student services, associate dean for student affairs and associate professor of family and community medicine. Dr. Horn provided integrated services and programs supporting students’ academic and professional success across schools of medicine, nursing and biomedical sciences. For more than a decade, she was also the medical director of Circle of Hope Hospice of Visiting Nursing Association in El Paso. Dr. Horn received her medical degree from Baylor College of Medicine in Houston. Dr. David Buck, associate dean for community health: Dr. Buck is an expert in community health, serving as a professor in the Department of Family and Community Medicine for more than two decades at Baylor College of Medicine in Houston, where he also received his medical degree. Dr. Buck holds adjunct professor positions at the University of Texas Health Science Center School of Public Health and Rice University. He also founded Healthcare for the Homeless-Houston and Patient Care Intervention Center to improve health care quality and costs for underserved populations. The College of Medicine joins the University as its 15th academic college with a mission to address shortages of physicians in primary care and other specialties such as general surgery and psychiatry to improve health in communities with healthcare disparities. UH plans to admit thirty students in the inaugural class pending approval by the Texas Higher Education Coordinating Board and Texas Legislature, and accreditation by the Liaison Committee on Medical Education.